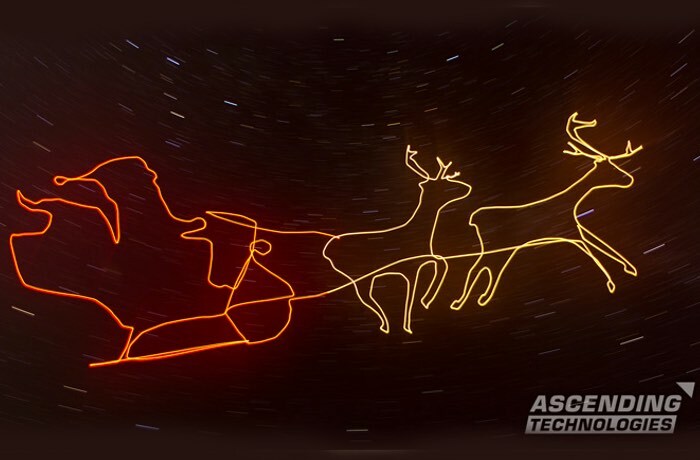 Ascending Technologies has this week released new videos of the first drone light paintings that are now available via YouTube to get you into the holiday mood. To create the light pictures the modified AscTec Falcon 8 UAS drone was mounted with an LED and was then controlled using the flight planning software AscTec Navigator, check it out in the video below. The world’s first drone light painting were shot while taking a long exposure photograph of every scene and up to ten minutes of exposure time was required say the production team and each painting is based on “a real drone flight. The Drone Light Painting Video is no fake”. World’s first Drone Light Painting Video “The Christmas Edit”: With this film Ascending Technologies wishes to express its sincere gratitude to all drone enthusiasts and operators, friends, customers and partner companies. As well we wish you a Merry Christmas and a good takeoff into a successful New Year. The complete Light Painting project was performed by use of a modified AscTec Falcon 8 UAS drone.